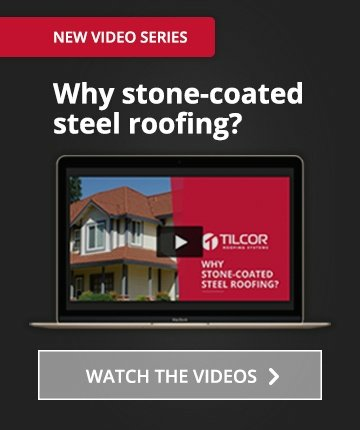 Tilcor is manufactured by the Ross Roof Group who has been involved in roofing over 4 generations since 1942. Its stone-coated and satin-finish roof systems incorporate cutting-edge Zincalume protective steel, which gives the tiles a significantly longer service life than typical galvanised tiles. Tilcor products provide a more visually pleasing finish and exceptional long term durability. The Tilcor range of pressed metal roofing tiles includes nine distinctive profiles – Bond, Classic, Tudor, Shake, Royal, Roman, Antica, CF Slate and CF Shingle. Our Auckland based ISO 9001-accredited factory manufactures products suitable for all climates and environments around the world. Installed in over 80 countries, the Tilcor Roofing Systems product range offers exceptional strength and durability in the harshest climates. Watertight and fire and earthquake resistant, our pressed steel roofing tiles can withstand hurricane-force winds and are backed by a Tilcor Roofing Systems warranty. we have everything you need here.